It is a genuine treat to be surprised by an automobile. Case in point is the all new Audi S6 which we had pegged for Audiâ€™s continuing trend of overt understatement. Untangle that oxymoron for a moment: in our opinion Audi has been dangerously close to the just-too-darn-conservative precipice in many of its latest high performance offerings. Weâ€™re not asking for â€œPimp My Audiâ€ from the factory, but we are most certainly part of the chorus of Audi owners calling for greater differentiation between the well designed (but ultimately more utilitarian) base models and their more exclusive Sport brethren. We first met the S6 â€“ static on Audiâ€™s stand â€“ at the North American International Auto Show back in January. Audiâ€™s own press fairly summed up that encounter for us, saying â€œ[the] S6 looks unmistakably â€¦ supremely athletic out on the roads â€“ but without even the slightest hint of aggression.â€ A puzzling enigma then, the S6 was a car that promised unbelievably well sorted performance all wrapped up in a rather benign package. We therefore arrived at Audiâ€™s S6 press launch with an inherent bias. The S6 would be given no free ride on this trip. Like a potential star player in the coachâ€™s doghouse, the vehicle would instead need to work twice as hard to earn respect and a spot on the field. Thankfully for us, the S6 stepped up with a brilliant performance. Continuing a moment with the sports analogy, any player that is looking to prove something is going draw on a lot of heart. The S6 has a heart too, and it beats furiously like a jar of lightening jacked on some wicked performance enhancing drug. We are of course referring to S6â€™s V10 FSI powerplant which simply cannot be appreciated via any press release, any car sitting on display at an auto show or even this story for that matter. Letâ€™s just agree on one thing: the V10 is astonishingly better than you can even imagine. It purrs on ignition and is positively thunderous, always with more in reserve, when pushed. For any remaining skeptics, the technical details clearly authenticate the powerplant. Audi motorsports-derived FSI technology injecting precisely metered fuel at high pressure directly into the combustion chambers provides highly efficient combustion and boosts performance. Aluminum alloys and technically advanced production techniques have been used extensively throughout to provide strength and torsional rigidity while reducing any potential vibration and ultimately saving weight (the engine weighs just 485 lbs). At 435 hp, power output sits squarely in territory that never even existed for performance sedans in the recent past. Even more than horsepower, though, is the impressive torque curve whereby over 90 percent of the vehicleâ€™s 398 ft.-lbs. is available as low as 2,300 rpm. Piloting the S6 is an intimate affair thanks to Audiâ€™s one-piece sports seats which include an integrated headrest and race seat-inspired side bolsters. Finished in supple Napa leather (and seemingly infinitely adjustable), these seats are as functional as they are comfortable. The driving position affords just enough extra room â€“ particularly for taller drivers â€“ compared to the sure-to-be-often-compared RS4 (more on that in a moment). Steering feedback is well-balanced and one gets the notion that they are driving something more akin to a bonafide sports car as opposed to a sports sedan. Audi has thoughtfully included shift paddles on the wheel to make the driving experience even more dynamic. Thanks for the aforementioned FSI powerplant and a drivetrain designed by Audi from scratch for the S6, shifts are lightening fast and the driver never feels an issue running the engine flat out to near-redline speeds in a quest for acceleration. We found the â€œSâ€ sports mode to be a little cumbersome in city driving, but once in a little more open traffic it gave us the aggressive shifts we desired. One of the best features of the S6 is its absolutely intoxicating exhaust note. In conversation with Filip Brabec, Audi of Americaâ€™s Product Planning Manager, we learned that Audi had gone to great lengths to find the right note for the S6. â€œWhile the S8 was intentionally toned down, we decided to give the S6 a decidedly more aggressive exhaust tone,â€ commented Brabec. He added that, â€œâ€¦ the S6â€™s combination of V10 powerplant and purposeful exhaust treatment probably gives it one of the sportiest sounds of all Audis available today in the market.â€ No kidding. Another very simple, yet highly convincing feature of the S6 is its LED daytime running lights. Audiâ€™s dominating single-frame grille is typically the attention-grabbing feature up front, but in this case the white-glowing LEDs categorically steal the show. Five to a side (representing the 5 cylinders on each side of the engine), the daytime running lights look positively menacing in the rear view mirror as the vehicle approaches from behind. Unfortunately the LED daytime running lights are not available in Canada, although we hear that dealers are already looking for ways to order them so they may be retrofitted on Canadian S6â€™s after the fact (a simple modification apparently). After seeing them in person weâ€™re left wondering which Audi enthusiast will be the first to retrofit them to a completely different Audi model? As previously mentioned we had a few pre-existing biases before we ever got to experience the S6 as a driver. For one thing, while we applaud the choice of a standard 19â€ wheel â€“ and itâ€™s hard to imagine that in the very recent past a 17â€ OEM wheel was considered supersized â€“ we are frankly underwhelmed by the actual wheel design. Highly complicit in our initial complaint about the S6 being too plain, the wheels utilize a flattened spoke design which do not foreshadow tremendous performance. Likewise, with the exception of the wonderful daytime running lights, the entire exterior lacks the type of drama we would prefer to see in a vehicle with such earth shattering performance capabilities. 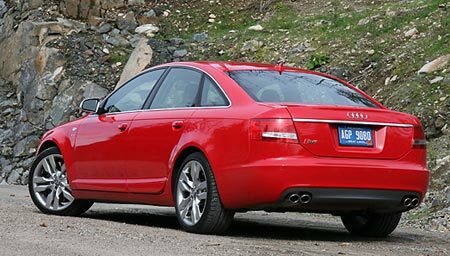 We will acknowledge that Audi is masterful at the understated (also known as the â€œsleeperâ€) design. The S6 in a non-showy color could easily be mistaken for just another A6 on the road. This would of course be much to the detriment of any lesser car (of which most on the road will fall precisely into that category) that attempted to out maneuver the S6. 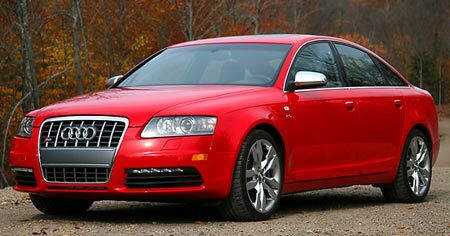 We further acknowledge that our test S6 was most definitely not a non-showy color; red is a very good Audi color and helps draw the S6 out of its shell. This begs the interesting question about the RS4 versus the S6. Sure, this is not even close to being an apples-to-apples comparison, as the cars belong to totally different classes. Still, we have to believe that buyers in the market for $70k+ high performance vehicles might take a long, hard look at both alternatives. To sum it up nicely: the RS4 oozes aggressive curb appeal in a way in which the S6 cannot compete, while the S6 provides both the interior space and the world-class powerplant which the RS4 lacks. 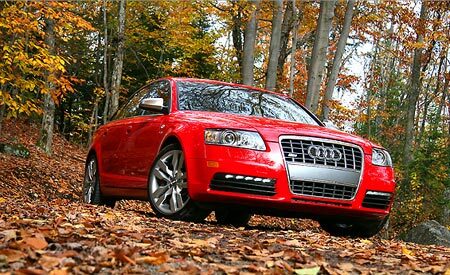 Audi publishes 0-60 times of 4.8 seconds and 5.1 seconds for the RS4 and S6, respectively. We know that the actuals are 0.2-0.3 seconds faster. Ultimately many factors would come into play if one had to choose between the two vehicles, but we give the slight edge to the S6 which (with a set of the right aftermarket wheels) starts to approach the best of both worlds. It is worth mentioning that all S6â€™s (as well as A6 / A8 / S8 / Q7) with build dates after November 2006 will come with Audiâ€™s new Audi Music Interface enabling iPod integration. We played with this feature in the S6 and found it to be just the solution that many audiophiles have long searched for. The system allows integration of iPod menus into MMI and instrument cluster displays, including Artist and Title information. Although the iPod remains stowed â€“ and powered â€“ in the glovebox (the center armrest for the Q7), the driver has full fingertip control of the music via MMI or steering wheel buttons. The AMI-iPod adapter cable is compatible with Generation III and IV iPods, the iPod Nano and iPod Photo models, all of which use the same standardized connector. There will also be additional cable adapters in the future providing for USB and 3.5mm connections. While we were not provided with firm pricing for this option, it sounds like it will be in the $300 range. 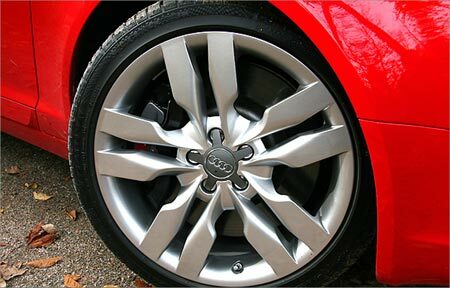 Audi Accessories is also currently working on a retrofit solution for previous MMI-equipped Audi vehicles.